Wilson Pickins Promotions proudly welcomes Kentucky based bluegrass band TURNING GROUND to the agency. The Wilson's met up with the band after a Festival performance several years ago in Ohio and became fast friends. Melanie Wilson says, "Their energy and soul during the performance lit the crowd on fire and after meeting them I knew they were something special on and off stage. I've been a fan and we've been pals ever since." With a jam packed tour schedule that keeps them on the road over 200 days each year, Nu-Blu still takes time to give back and use their talents to further the music they love. 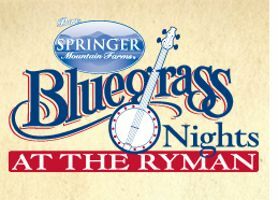 Working with several partners, including Peterson Tuners, Saga Instruments, Daddario Strings, and The Foundation for Bluegrass Music, they are taking bluegrass music into the schools everywhere they can... and it's not just introducing kids to the music! Marion, VA -- Virginia is for Lovers and the state loves Song of the Mountains a syndicated music television series taped in Marion and aired nation wide on PBS. The state House of Representatives and the Senate have siged a resolution making the program the state's TV Series. Asheville, NC -- Asheville, where deep-seated bluegrass roots harmonize with new talent and innovative sounds, is on the verge of becoming one of America's top music cities. From the nation's longest-running folk festival and Grammy-winning musicians to Moog Music and a weekly drum circle, music rings through the air in this Blue Ridge Mountain city. NEW: The sounds and melodies of Asheville can now be heard online via Explore Asheville Radio. Rounder Records recording artists the Lonely Heartstring Band have now climbed into the AirPlay Direct “Top 50 All-Time” Americana / AAA Album Chart with their debut CD Deep Waters! They find themselves in very good company. AirPlay Direct is pleased to announce the signing of The Lonely Heartstring Band to an AirPlay Direct Artist Endorsement Deal. Four of the five band members of The Lonely Heartstring Band met while students at Boston’s Berklee College of Music. They are the winners of the 2015 International Bluegrass Music Association’s Momentum Award, and feature Charles Clements (bass & vocals), George Clements (guitar & lead vocals), Gabe Hirshfeld (banjo), Patrick M’Gonigle (fiddle, vocals), and Matt Witler (mandolin). The Boston-based bluegrass quintet released their debut album Deep Waters June 3 on Rounder Records. AirPlay Direct’s Collective Evolution is pleased and proud to sign Levi Austin to a Career Development Deal with Collective Evolution. Collective Evolution is a boutique, high-end entertainment and media consulting firm. Our clients include recording artists, record labels, record producers, management companies and radio promotion / PR firms. We deliver creative consultative services and customized business solutions to our clients based upon their specific needs and goals. Gary Cotten, self-taught, Master Luthier from Grayson, Kentucky has handcrafted hundreds of beautiful, full, rich sounding guitars since his start many years ago. He carefully selects the musicians that he would like to own and play one of his instruments before handing over a guitar. Jeff Autry is one of the chosen few. Xenia, Ohio -- Joe Mullins & the Radio Ramblers are very proud to announce the addition of a new booking agent and team member. Laura Mainer will now be representing the band full-time as well as manage the band's day-to-day office needs. Branded Bluegrass is a band from central Indiana with a catalog of music deeply rooted in traditional bluegrass and gospel, with a flair for some contemporary bluegrass, classic country and even a little bit of rock ‘n roll now and then. Audiences are sure to enjoy their diversity, tight harmonies, energetic stage show, and charismatic personalities. New York, NY -- Ace Hotel and Martin Guitar have been friends and partners for a half-decade now, cultivating a collaboration that's deeply rooted in a shared passion for music and the desire to support those who make it. In 2016, Martin and Ace Hotel will evolve their partnership from in-room strumming and 5 at 5 into a two-part initiative that centers around public outreach and an openhanded support towards musicians.